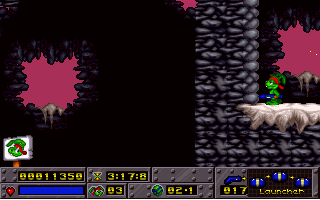 DOS Jazz Jackrabbit: Holiday Hare 1994 (shareware) in 02:23.76 by Ilari. Jazz Jackrabbit is one of the earliest products released by what was then known as Epic MegaGames, better known these days for producing the Unreal engine. It was viewed initially as being a pastiche of the Sonic the Hedgehog games and arguably developed along those lines, bearing much of the same fast platformer action. This run completes a special Christmas episode called Holiday Hare. This is the 1994 version of this episode. A run has been made for the 1995 version of Holiday Hare. There is also a run of the original game available.